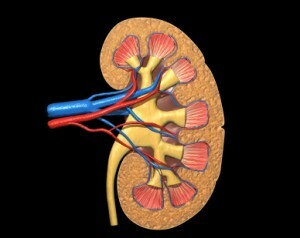 A risk of long-term lithium treatment is that it can cause kidney damage. However, a new study suggests that continuing lithium treatment after a diagnosis of chronic kidney disease does not necessarily increase the risk of irreversible end-stage kidney disease, which is defined as either the need for either chronic dialysis or a kidney transplant. The 2017 study by researcher Lars Kessing and colleagues in the journal Acta Psychiatrica Scandinavica used Danish health databases to track data from all individuals who received a diagnosis of chronic kidney disease between 1995 and 2012 and also had a history of lithium treatment (754 patients) or anticonvulsant treatment (5,004 patients). Kessing and colleagues found that patients who continued taking lithium after an initial diagnosis of chronic kidney disease had decreased rates of end-stage kidney disease. This also held true for those who continued anticonvulsant treatment after a diagnosis of kidney disease. One point of uncertainty was introduced by the finding that the subset of participants who were taking lithium specifically to treat bipolar disorder did have a higher rate of end-stage kidney disease. This was not true of the participants who were taking anticonvulsants to treat bipolar disorder. Kessing and colleagues concluded that after an initial diagnosis of chronic kidney disease, continuing lithium did not necessarily increase end-stage kidney disease. Switching to an anticonvulsant, as is sometimes the practice after a kidney disease diagnosis, may not confer any benefit.